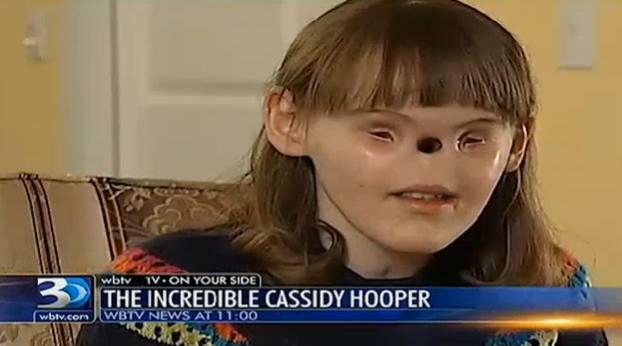 March 07, 2013: US teenager Cassidy Hooper shares how she has overcome being born with no eyes or nose and found the secret to living a joyful life. A US teenager born without eyes or a nose is preparing to have reconstructive surgery that will allow her to smell and breathe through nostrils for the first time. Cassidy Hooper, 16, of North Carolina was born with a rare and unexplained birth defect and has been undergoing facial reconstruction surgeries since she was 11 years old, ABC New reports. But the high school student is set to have three final surgeries at Levine Children’s Hospital in the next two to three weeks to give the teenager her own nose. Cassidy told ABC News she was excited about the procedures, which would see doctors take cartilage and bone from her skull. "I’ll have a real nose like everyone else’s," she said. Doctors were unable to explain why Cassidy was born without eyes or a nose and told Cassidy’s mother, Susan Hooper, 42, that her daughter was otherwise healthy. "Her heart and brain are normal," Ms Hooper said. "Nothing else is going on with her." As a child Cassidy was fitted with prosthetic eyes but the family had not been able to afford to replace the $5000-a-piece eyes as she outgrew them. Ms Hooper said the family hoped to buy new prosthetic eyes once Cassidy’s nose surgeries were complete.